They say the best way to hide something is to hide it in plain view, which is exactly what Audiovox does with their Home Decor line of speakers. 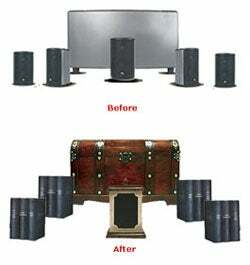 By enclosing speakers and subs in faux books, planters, vases, floor standing baskets and trunks, you can hide your sound without hindering your enjoyment of it. In homes that have a more Victorian look, a chest and actual books—the things made of paper you haven't touched since college—would match the surroundings better than a set of Xbox 360 speakers, as good as the latter may sound.